« Announcing the FEED2013 Finalists! I hope this post finds you well, having soaked up some of the excellent art offerings this spring, from numerous exhibitions of Richmond’s prodigious art students to new shows at local galleries and institutions. Since last June, 1708 Gallery has certainly been pulling its weight, hosting ambitious and captivating solo exhibitions, group shows, and special events. 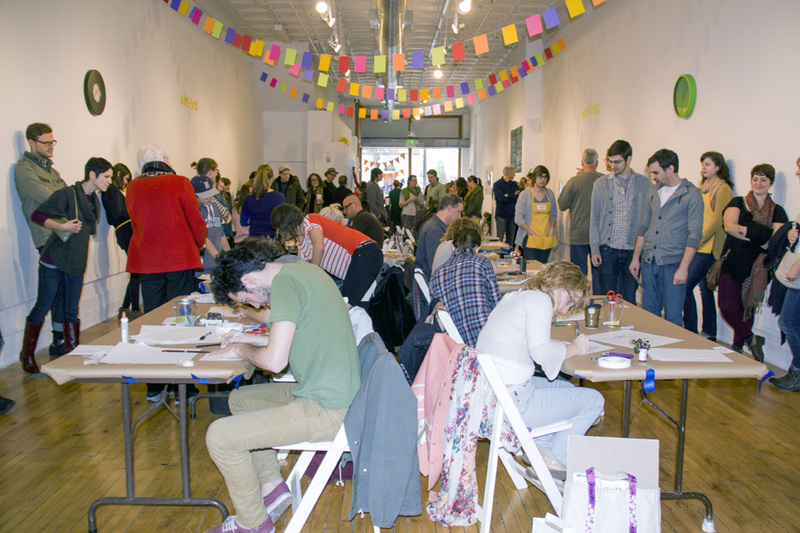 1708 is bolstered through such eye-popping, heart-warming, and thought-provoking events as InLight Richmond, Monster Drawing Rally, and MIXOLOGY. However, the gallery’s day-in, day-out mission of presenting exceptional new art is sustained and renewed through similarly generous donations to our annual fund, which make exhibitions like Crest, The Obstruction of Action, and To the Source possible. As you contemplate giving to 1708’s annual fund, consider both our recent past and the future potential of Richmond’s dynamic, ever-expanding art scene. Consider 1708’s ability to present stirring, relevant, alluring work, exhibition after exhibition and season after season. As Richmond starts to make way for its own ICA, I’m compelled to remember our history and the gallery’s contributions towards the increasingly visible and lauded cultural economy of this city. 1708 was founded 35 years ago by a group of artists dedicated to making space for their visions where there previously was none. 1708 was grassroots and local before it was fashionable to be grassroots and local. And through you, it still is. Thank you for your support of 1708 and of the arts in Richmond! Donations to 1708 Gallery’s fund can be made online at : www.1708gallery.org/join-and-engage/annual-fund. This entry was posted on Friday, June 21st, 2013 at 10:33 am	and is filed under General. You can follow any responses to this entry through the RSS 2.0 feed. You can leave a response, or trackback from your own site.